America’s historical amnesia is particularly acute when it comes to clean energy. You’d think the attempt to leave fossil fuels behind is something new in the world, as though our arguments over technology, policy, and economics are being had for the first time. In fact, the entrepreneurs and advocates pushing green technology today are inheritors of a rich history of innovation, experiment, accident … and occasionally farce. 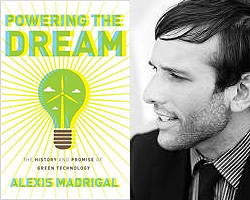 That history, too rarely told, is at the heart of Alexis Madrigal’s absorbing, often astonishing new book, Powering the Dream: The History and Promise of Green Technology. Rather than rehash well-understood problems or relitigate well-entrenched debates, Madrigal tells stories, unlikely, idiosyncratic stories, about real human beings. You probably haven’t heard these tales — I hadn’t — so the book yields a continual sense of discovery, sometimes delight. Madrigal has produced a kind of anti-history: a chronicle of paths not taken, failed visionaries and cranks, near-misses and fiascos. Along the way there are lessons learned, but no Grand Theories or first principles. With epistemic humility that’s rare in the green space, Madrigal picks through these events for observations about what seems to work and how we might avoid our past mistakes. Last week I talked with Madrigal — who’s now leading The Atlantic‘s new tech channel — about the book and some of its stories and themes. Our conversation will appear in five parts over the coming week.